Sake no Kanryo. Store-based sales and a local sending out are received about local sake, sake, sake-wine, wine, beer, original brand sake. The liquor store, Sake-no-Kanryo, based in Jishumachi town of Ichinoseki City in Iwate Prefecture, provides both store-based sales and local delivery of sake, Japanese sake, shochu, beer and wine. The storekeeper uses his refined senses to select the very best products. The Sake-no-Kanryo original brands also enjoy a good reputation. There are many other kinds of sake available at the shop that are not shown on the web site. So you are welcome to visit our shop. Please make enquiries or orders by telephone or fax. This o-sake, served cold or at room temperature, has a thick richness with a slight bitterness and clear after-taste; its full-bodied taste make it an o-sake that can be appreciated just by itself. In Japanese the name of the yellowtail fish changes as it matures from Inada to Warasa or Hamachi and finally Buri. Warasa is very reasonably priced at the present time and does not have as much fat as Buri. The simple taste of the Warasa is used to create “Deep-fried Tatsuta.” After marinating the fish in soy sauce, sake and mirin and covering it with potato starch, it is deep fried to a crisp. The accompanying sauce was a blend of cucumber and Mizuna mixed with yoghurt, lemon juice and salt. Thick-stemmed fresh asparagus is grilled on the stove to retain its crisp texture. This o-sake brings out the fresh taste and sweetness of the asparagus and cucumber so that salt does not even need to be added. The o-sake also goes well with the sour taste of yoghurt and lemon. I think it would also be a good accompaniment to Nabe (one-pot) dishes. You can enjoy the subtle change in the flavor of the o-sake if it is opened and left capped in the fridge for about a week; the taste becomes mellower. Hello everyone, my name is Kei and I am a blog staff member. 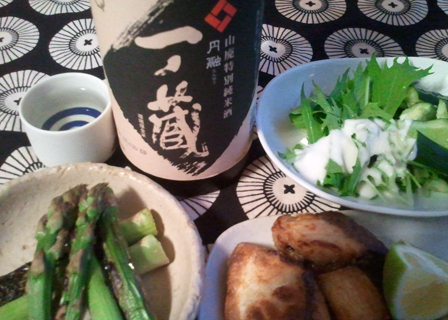 I would like to tell you about the combinations of o-sake and food that have given me great pleasure. I hope that you will enjoy my reports. Bitter gourd is a summer vegetable that is fried and baked in this dish. The flesh and seeds are slices together into rings and then fried in plenty of oil until the seeds are crisp. Served after a little salt is sprinkled on top. Red peppers were fried together as a side-dish. When o-sake is sipped at the same time, the oil gently flows out, creating a mild and exquisite taste. 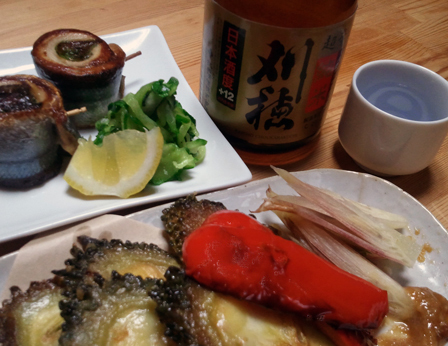 Next is the fish dish - rolled grilled saury. The saury is placed on finely sliced leeks seeped in soy sauce and then rolled up and fastened with a toothpick. The rolled saury is then frequently turned and fried on both sides and served with a squeeze of lemon. The combination of these two dishes produces a pleasant blend of acidity and a rich flavor. You cannot beat the taste of the oily saury served in this way. Wedges of cucumber rolled in salt and with a squeeze of lemon juice go perfectly with this dish. Today I drank the o-sake at room temperature but when it becomes colder I’d like to try drinking it warmed. The under-age drinking of alcohol by minors is prohibited by law. Copyright ©2009-2014 kanryo-sake All Rights Reserved.